Banking stocks were the top losers, with many lenders hitting more than two-year lows due to lower-than-expected advance tax payments and the potential impact of a possible sovereign rating downgrade of European countries that may compound the continent’s protracted sovereign debt crisis. “The current environment and news like the impending food security bill means the fiscal deficit is likely to widen and the country’s GDP growth will further decrease," said Kishor Ostwal, chairman and managing director of CNI Research. “The market is straining for positive news to trigger a rally, but it’s all negative at home and overseas right now." 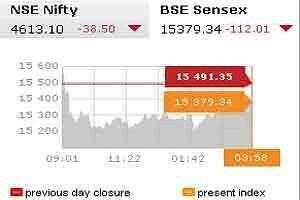 Main 30-share BSE index closed down 112.01 points at 15,379.34, with 21 of its components falling. One stock remained unchanged. The benchmark index had fallen 4.5% in the previous week to its lowest close in more than two years. The Reserve Bank of India on Friday opted to pause an aggressive tightening cycle that involved lifting rates 13 times since March 2010, as the economy tussles with a worrying combination of weak growth and high inflation. Cabinet agreed on Sunday to tackle widespread malnutrition with food subsidies for two-thirds of its 1.2 billion population, a populist move that will add to a swollen fiscal deficit. A senior minister told Reuters the bill would be sent to parliament this week. Research house CLSA said in a note on Sunday that the benchmark index could possibly slide to 11,000-12,000 points due to persistently high inflation, a weakened rupee, high interest rates and the crisis in Europe. CLSA also cut India to “neutral" from “overweight" in its Asia-Pacific ex-Japan relative return portfolio, its third weightage cut for the country this month. Shares in India’s biggest banks were hit the hardest, with the sector index closing down 3.1% to 7,920.75 points, closing below 8,000 points for the first time since September 2009. ICICI Bank, India’s biggest private bank, fell 2.8% to ₹ 657.20 ($12.47), having fallen to a low of ₹ 645 earlier in the day, its lowest level since June 2009. Benchmark heavyweight State Bank of India, the country’s largest lender, fell to its lowest price since July 2009, before recovering to close at ₹ 1,628.10, a fall of 3.0%. Stocks in India’s flagship software services industry also fell as Europe’s debt crisis showed no signs of easing, led by industry bellwether Infosys, which closed down 1.8% at ₹ 2,676.40, having fallen as much as 2.5%. Shares in market-leader Tata Consultancy Services (TCS) , which slid as much as 2.8%, closed 0.2% lower at ₹ 1,143.65. India’s $76 billion IT sector gets more than 90% of its revenues from overseas clients, and counts the United States and Europe as its biggest markets. An end to the continent’s worries appeared no closer on Monday as investors fretted about the possibility of a credit rating downgrade for several European countries, including Belgium, Italy, Ireland and Spain. Real estate giant and infrastructure conglomerate Larsen & Toubro, fell as much as 5.5% and 4.2%, respectively. Both firms have seen high interest rates and slowing growth temper construction demand this year. Shares in DLF closed down 2.8% at ₹ 189.45, while Larsen shares fell 3.7% to 1,032.90 rupees, after recovering from a low of ₹ 1,025.10 earlier in the day, its lowest price since May 2009. Foreign institutional investors (FIIs) have been net sellers of around $300 million so far in 2011, compared with a record investment of more $29 billion in shares in 2010, data from the stock market regulator showed. The broader 50-share NSE index closed down 0.83% at 4,613.10 points. In the broader market, falling stocks outnumbered gainers by a ratio of around 4:1, with 605 million shares changing hands. Asian and European stocks as well as U.S. index futures fell on Monday, with South Korean shares tumbling as much as 5%, as news of the death of North Korean leader Kim Jong-il sparked fears of regional instability in Asia. MSCI’s broadest index of Asia-Pacific shares outside Japan was down 2.1% at 1530 (1000 GMT), while Tokyo’s Nikkei stock average closed down 1.3%. Shares in cash-strapped Kingfisher Airlines rose as much as 3% after the State Bank of India said lenders were trying to help the beleaguered carrier. Shares in Apollo Hospitals rose as much as 2.9% on Monday after the company clarified on the shares it allotted to its promoters on conversion of warrants.